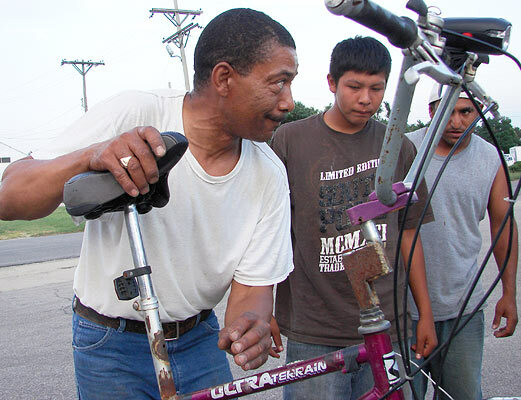 I don't know anything about bikes, but when the Hutchinson, Kansas, online magazine What's Up Hutch? posted a video of a man riding an oddly tall bicycle and asked for more information, I couldn't resist stopping when I saw the cyclist in traffic a few days later. 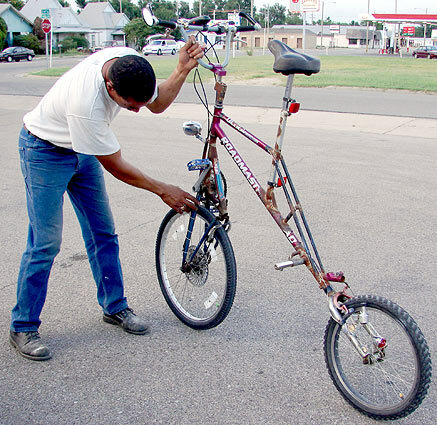 Leslie Bernard of Hutchinson proceeded to show me the home-built bicycle he calls the "Tornado." He demonstrated to me and a small group of passers-by how he mounts and dismounts the bike (above), and then rode off to return with a second bike, this one helped along by a motorized fan (below). Bernard told me the design was similar to early bicycles called "penny-farthings", a name which referred to the British penny and farthing coins of the time being very different in size, such that when placed beside each other, they reminded one of the differing wheel sizes of the bike. He calls the motorized version the "Hurricane." As near as I can tell, the motor helps only the fan and is not connected to the gears. 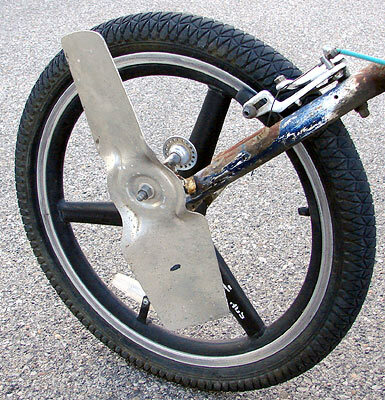 I believe the stabilization rotor on the rear wheel is just for looks, in imitation of those on helicopters. Bernard delighted in explaining the origins of some parts of his bikes, but kept a few secrets for himself. 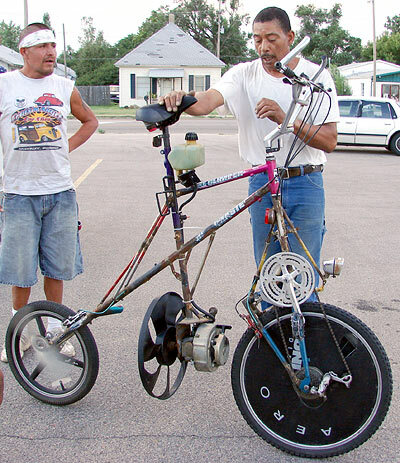 He did mention a third bike, the "Tsunami"; if I run across that one, I'll post.